Can you have exit tickets for number talks? As math teachers, many of us have been implementing number talks for quite some time. Number talks are an important part of math instruction, and conversation particularly around math strategies must be learned and practiced consistently. We encourage our initiative schools to strive for engaging in number talks three-five times per week for seven-ten minutes per day. We see varying levels of full or partial implementation of number talks when we go into schools. Some do number talks every day, some three days a week, and some are struggling and usually end up with only two days per week. First Responders. Sometimes, we have these kids who always have their hands raised. Like EMS, these First Responders are always there on the scene as soon there’s a call! In class, First Responders can be comforting and you can come to depend on them when no one else is raising their hand or giving any feedback! But sometimes, in a number talk, First Responders can deter other kids from wanting to give their ideas about how they got their answer. Quickly noting, “No First Responders!” after asking a question (these kids know who they are!) can help give kids who might feel lost a chance to jump in. Repeat. We call on a student, say “repeat” and they have to repeat the previous strategy that was given by another student to see if the student is internalizing the strategy and actually understanding it. Car vs Airplane. If we are in New York and we want to drive to Disneyland, it’s going to take 42 hours. But, if we were going to fly in an airplane, it will only take six hours, which is much more efficient. After a number talk, we have students reflect and realize that there are often many ways to get to the number that are great, but that there are certain ways that might get us there more efficiently. What is the purpose of number talks? This is another question I come back to often. The short answer is: to get kids to communicate reasoning. In some of our project schools that are implementing number talks, we see an increase in our state test scores in the communicative reasoning area. However, I was in a district this week, and though their communicative reasoning scores are going up, their actual number sense is not. I’ve been in lots of classrooms where kids have indicated that they have the right answer or that they knew the strategy even if they didn’t because they want to blend in. So, we might ask a different question: does the number talk actually promote number sense? Do number talks overwhelm students with strategies and terms that just end up creating more confusion? Math Mights to the Rescue! I was in one of our initiative schools last week listening to a really great number talk. There was a kid that came up with a strategy and even named it, saying, “I used partial sums.” He even talked about how he decomposed the number by place value. Another student said, “I came up with a way to do compensation,” but when I went to listen to the explanation, it was also partial sums. Another students said, “I did it the traditional way,” and actually still did it with partial sums. Sometimes the kids have the strategies, but get confused by the terminology and aren’t naming them correctly. This kind of confusion was the reason behind the creation of Math Mights, which are really taking off in schools that have adopted them! Teachers and students using the Math Mights have a common language, not just in their own grade level, but vertically aligned across grade levels. Strategies like compensation or decomposing/composing will go with a child from 1st grade through 5th grade, and students will see different types of numbers like whole numbers, fractions, decimals, anchored in those strategies. There are many ways to solve problems, even more than the strategies we’ve chosen to represent with Math Mights. However, we chose the strategies that would give teachers and students the biggest bang for their buck. When introducing Math Mights, you shift a bit from a traditional number talk to more of a strategy talk where the class comes together to focus in on a specific strategy for a day or two. The 7-10 minutes you have set aside for number talks now becomes a focused time to talk about that strategy. 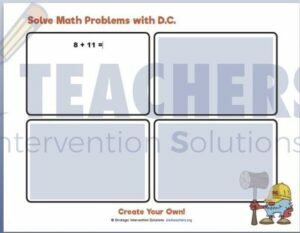 For example, if you start by introducing D.C. and the strategy of composing, you’re helping students to really understand the idea of that character, and how he walks through Mathville looking for friendly numbers. It starts in 1st grade by making a friendly ten and, as students get older, D.C. looks for a decade number, and eventually we call the number D.C. is looking for a benchmark/landmark/friendly number. While students might be able to cite all kinds of strategies (partial sums, place value, etc.) we really want to see if kids can focus on using one strategy for a particular problem. We want conversation to happen where we might start to get kids to think about that strategy but also provide a variety of numbers to illustrate the strategy and focus number talks to help students understand the strategy completely. 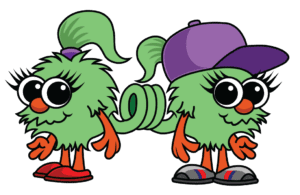 Our Math Mights Download Companion is a new release that helps teachers really understand the Math Mights characters in depth and provides what we call exit tickets for number talks. These documents help assure that, when I’m doing number talks, I am really building strategies. Exit tickets ensure that it’s not just the first responders or a few of the students getting the strategies. I want over 80% of my kids to be fluid in the strategies that we’re talking about and have them be able to relate it to the other things we’re doing in math. Some might argue that exit tickets really “don’t count” as number talks because they aren’t really mental. However, if students really have a mastery of D.C.’s strategy, they will be able to represent pictorially in a number bond how they are decomposing and composing numbers, which is an important element to support mental math. By using an exit ticket, I can pass it out, collect it, and see at a glance how the class is doing. Do they really have the strategy? Can they show me in multiple problems? In 1st grade,it might be single digit plus a single digit problems, in 2nd grade we might start off with a double-digit plus a double digit numbers, ramping up to a three-digit plus a two-digit, or even a three-digit plus a three-digit, using friendly numbers that would lend themselves to this strategy for the students. The download is unique because it comes with just four sample problems at the beginning level and four at the advanced level. Obviously, I could write 80 pages of additional problems in the companion, but the idea of the download is that it’s a sample to prompt you to think about what else you could do. The most important page in the Math Mights Download Companion is the “Create Your Own” page. Teachers can type their own problems into the blank fields and use that as an exit ticket in their classroom! A common struggle for the teachers I work with when doing number talks is how long to focus on each strategy. When do we move onto the next one? Or even away from addition into subtraction strategies? The answer is whenever your kids are ready, and using exit tickets in the classroom helps teachers know when that time is. The time frames may not match exactly what you’re teaching in your classroom, but strategy-building is universal. In many of our schools, they could just work on these strategies for several months, even in 2nd, 3rd, 4th grade because it’s going to benefit students overall in their number sense. For each new strategy, like compensation with Abracus, you have sample problems for beginning, sample problems for advanced, and most importantly, you can fill in your own problems in the “Create Your Own” page. 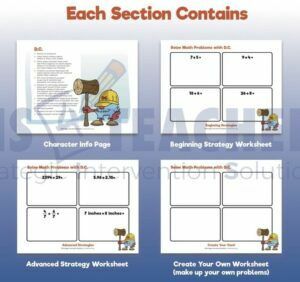 As kids are learning more than one strategy, it’s important to make sure they know how to solve the same problem using each strategy, so we have “Let’s Review” pages that give you one problem with space to solve it using the different strategies. There is also a “Create Your Own” version of the “Let’s Review” template so you can type in your own problems. When working with severely at-risk or special education students, it’s important to pick only two of the Math Mights that you want to focus on. Their processing capacity may not be be able to handle all four ways, so we want to be able to accommodate those students by focusing in on two strategies for the grade that we’re teaching that might be the most important. So, exit tickets in number talks? Yes! It’s a good idea, and we need to look at number talks in a more strategic way so we’re actually building number sense. How do we know if students know it? Through exit tickets in the Math Mights Download Companion! 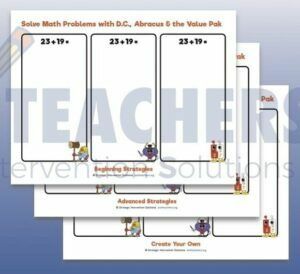 Coming Soon: Math Mights Subtraction Strategies and download companion! Scheduled to launch Winter of 2019! Be sure to like us on Facebook or follow us on Twitter so you can be the first to know when it’s ready!